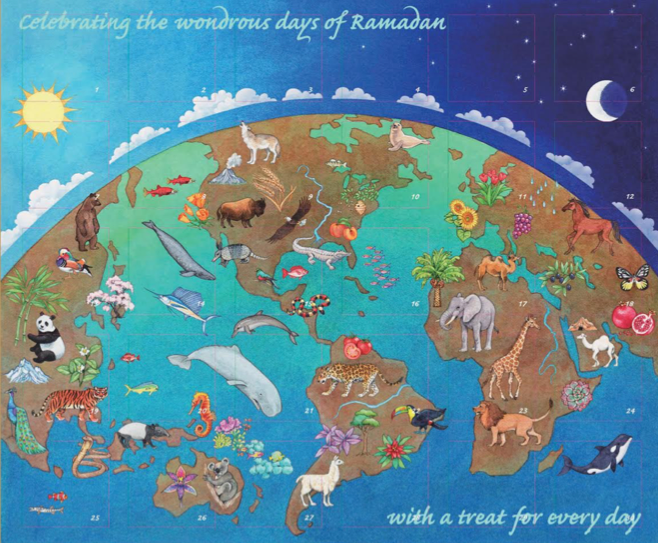 Track the days of Ramadan, with the perfect Ramadan countdown calendar ... and make each day count! A mom from Baltimore wanted to combine the joy of Ramadan and little treats for her young kids, packaged in a beautiful box that could be shared with family, friends, neighbors, or anyone curious about the holiday. And that's how the Iftar Treat Box came to be. Here's a writeup from coolprogeny.com about how we began, and another from the Washington Post focusing on kids during Ramadan. Designed as an Ramadan advent-style box calendar, the Iftar Treat Box has 30 compartments with a sweet treat behind each perforated door. Open one door each day to reveal a chocolate for every day of the holy month and a halal jellybean surprise for the last day. The Iftar Treat Box allows kids to experience the anticipation and joy of breaking fast, while developing a fun-filled iftar tradition counting down the days to the joyous festival of Eid at the end of the month. We also hope it represents a beautiful, joyful way to share Islamic traditions with friends and neighbors. Pick one up and spread the joy of Ramadan! 12 5/8 x 17/32 x 10 5/8 inches. 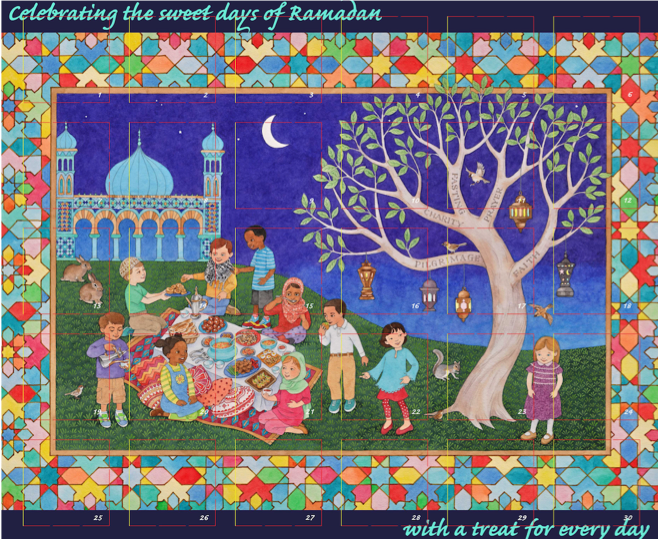 The "Sweet Days..." calendar features original artwork by award-winning children's book illustrator, Susan Detwiler, which captures the ideals of diversity, community, sharing, and joy through the iftar scene it portrays. The tree in the foreground includes five branches, each labeled with one of the five major components of the religion. The box has 29 perforated doors, which can be opened one a day throughout the month, to reveal a chocolate treat. While the last compartment holds a jelly bean surprise. The "Wondrous Days..." calendar features a new original design by Susan Detwiler, highlighting the wonders of the natural world. 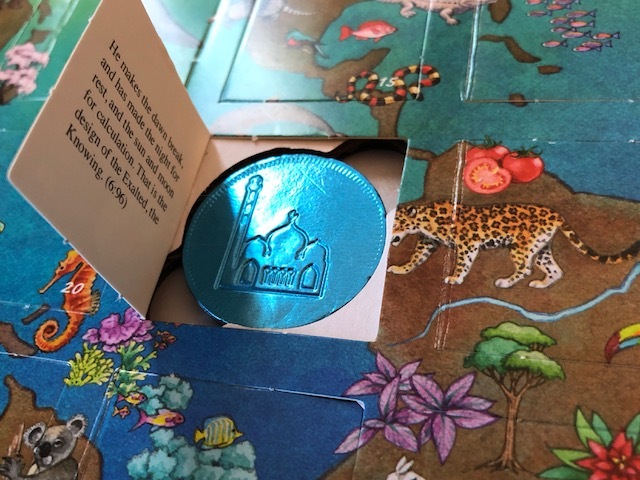 In addition to a sweet treat, each compartment reveals a Quranic verse on the inside flap inviting reflection and celebration of the wonder of God's creations while relishing the sweet joys of Ramadan. The verses on the Wondrous Days box (with the world map on the front) also reproduced below. Chocolates: Steenland chocolate, embossed with 1 of 6 Ramadan-themed designs in a variety of different foil colors. Founded in 1899, in Gouda, The Netherlands. Jelly Beans: Assorted flavor, individually-wrapped, Jelly Belly brand jelly beans. No gelatin. All halal ingredients. Suitable for vegetarians.